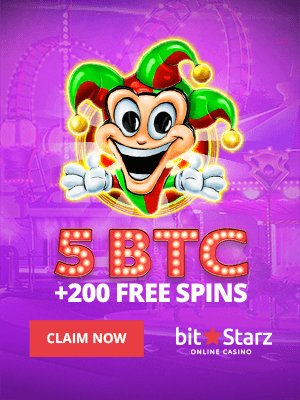 The crypto market is trying to make new highs, boosting the investor sentiment regarding a new uptrend. Some analysts are not that optimistic, though, saying the rise is not a natural trend but a result of someone’s buying a large amount of crypto. The number of BTC futures still reached a record high, so the market is being mostly positive and is not likely to start testing its local lows. On D1, BTC is approaching the round number of $6,000, still moving inside an ascending channel. The RSI is confirming the uptrend by bouncing off the support. A slight correction may be expected soon, but the price is then likely to get back. If $4,000 gets broken out, however, the long term downtrend may continue. 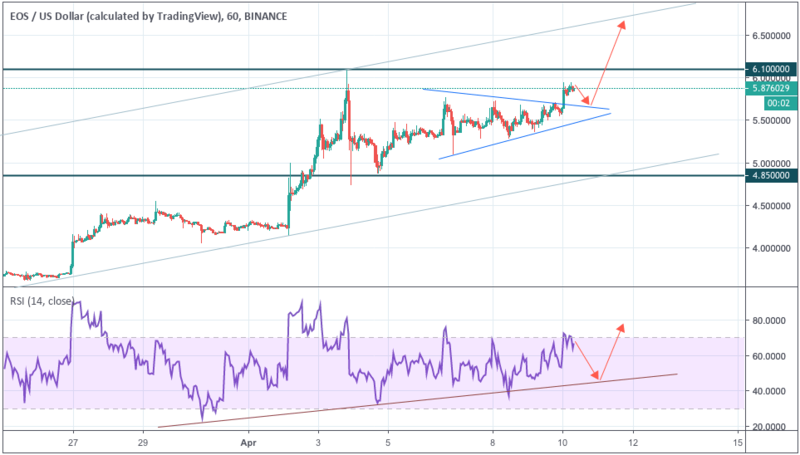 On H1, a triangle is being formed, and the price may be going to test its lower boundary at $5,155, then rising again to reach $5,700, which may get confirmed with the RSI testing the support. In case BTC tests the immediate resistance at $5,360 and breaks it out, the crypto will be sure to rise ahead, unless the support at $4,800 gets hit. The latter will happen in case the triangle gets broken out top down and the price stays below $5,050. EOS is trading higher around $5.87. On D1, however, it may get gown to test the lower channel boundary at $4.85, but only to then head towards $8.00, especially if the RSI tests the support. Once the resistance at $7.00 gets broken out, the price may get up further. Conversely, if the support at $4.80 gets hit and the price stays below the lower boundary of $4.75, the downtrend will finally resume. 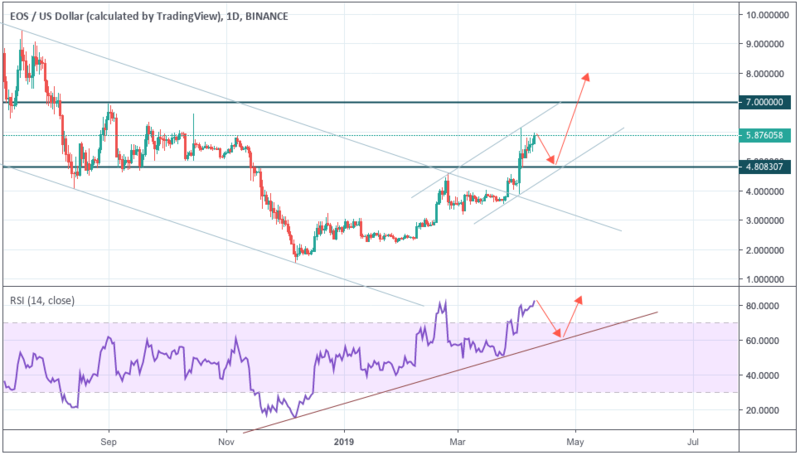 On H1, the triangle is nearly over, with the price likely to test its upper boundary at $5.65 and then to rise towards $6.65, which may get confirmed with the RSI testing the support and then the resistance at $6.10 getting hit. Conversely, if the support at $5.45 gets broken out and the price stays below, the crypto may then plunge to $4.85. 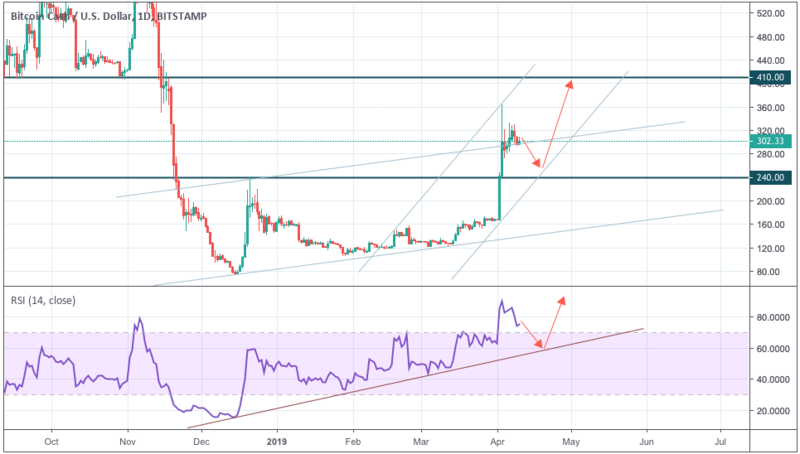 ETH is currently moving along the ascending channel, testing the resistance at $185. On D1, the crypto may slightly correct to test the support at $160, but only to reach then the target of $225. This will be confirmed if the RSI tests the ascending trend line. 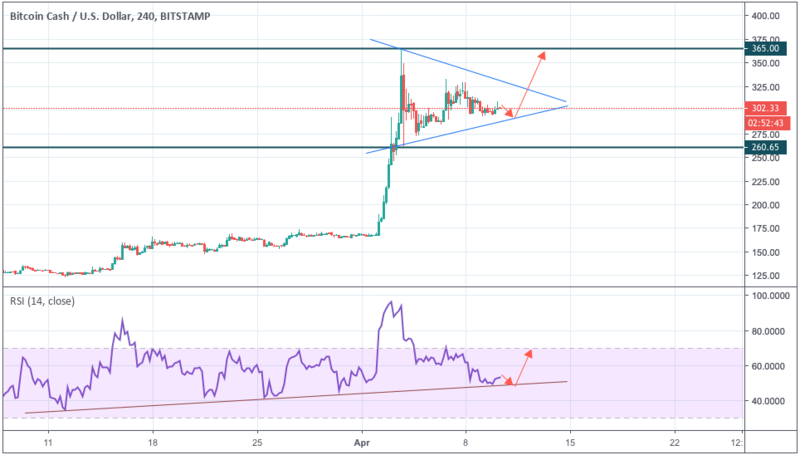 On H1, ETH is also attempting to rise, but is ready to test the ascending trend line at $180 in the short term. Then, it may continue rising to $200, especially if the RSI tests the support and the local resistance at $187.65 gets tested. Conversely, if the support at $173.45 gets broken out and the price stays below $170, ETH may plunge further to $155 and below. LTC is moving along an ascending channel around $88.52. On D1, it may get down to test the lower channel boundary at $79, and then continue rising to $140. The rise will get confirmed in case the RSI tests the support and the resistance at $110 gets broken out. Conversely, in case the support at $70.55 gets hit and the lower channel boundary gets broken out, the price may remain under $70 and go further down. 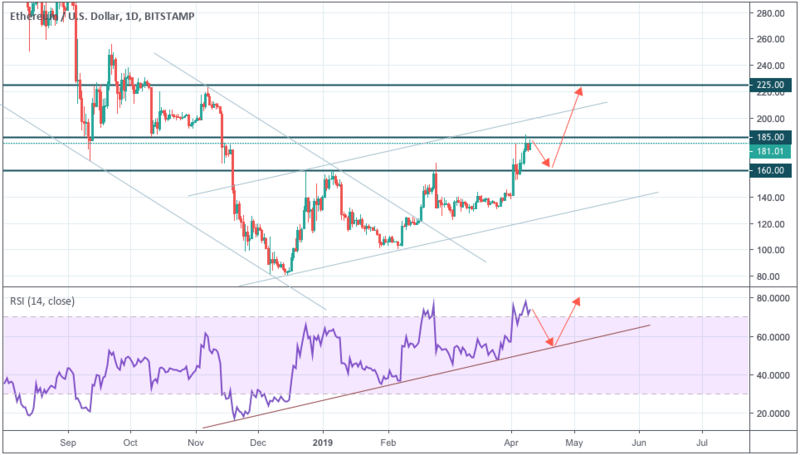 On H4, a triangle is being formed; in the short term, the price is likely to test its lower boundary at $8, but only to then head towards $115, which may get confirmed with the RSI testing the support and the upper boundary getting broken out. 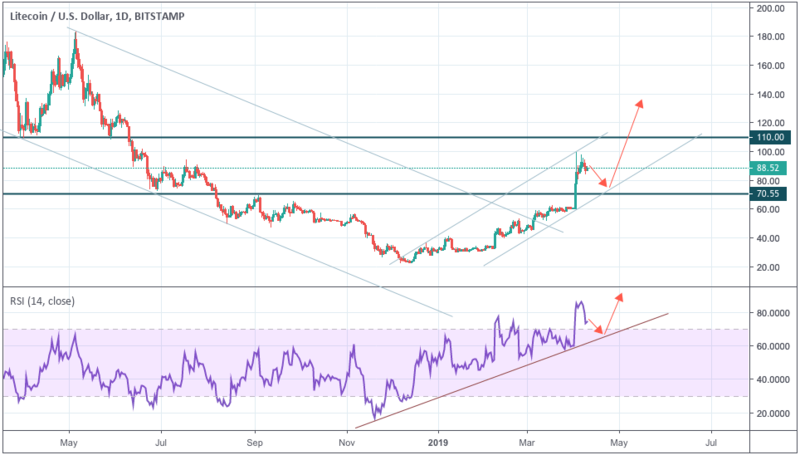 BCH is moving along an ascending channel, trading around $302.33. 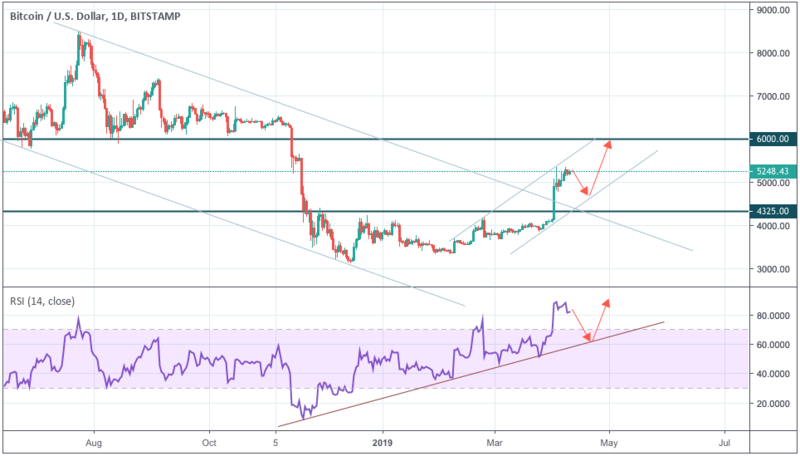 An uptrend heading towards $410 is being formed, although a correction towards $250 may happen as well. 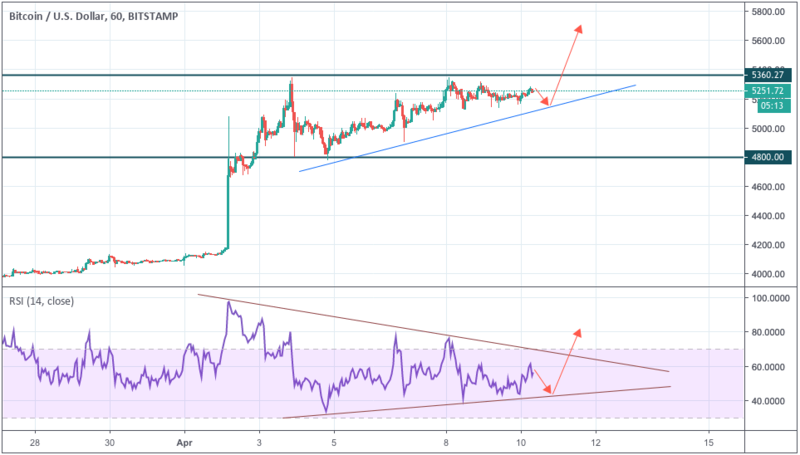 The uptrend will get confirmed in case the RSI tests the uptrend line. Conversely, if the lower boundary gets hit and the price stays below $235, BCH may get further down. On H4, a triangle is being formed; with low volatility, it may get broken out bottom up. In the short term, the price is likely to test its the lower boundary at $300 to head towards $365 later. This will be confirmed if the RSI tests the ascending trend line and the upper boundary at $330 gets broken out. The price may still head down and hit the lower triangle boundary as well, though.